Until the end of the 19th century, the chub was very prevalent throughout Flanders. But as a result of water pollution and the straightening and impounding of the flow of water, the Sword of Damocles hangs over the head of this species. It is for that reason that the Instituut voor Natuur- en Bosonderzoek (Research Institute for Nature and Forest – INBO) and the Agentschap voor Natuur en Bos (Flemish agency for Nature and Forests – ANB) have been stocking the IJse, which springs from the Sonian Forest, with cultivated chubs since 2008. And they are happy there. In the uninhibited, natural course of the IJse, the young fish are able to find calm spots in the water, while the fish that are more than one-year old search out spots with more rapidly flowing water. 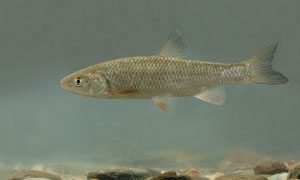 The Laan and the Dyle are also stocked with chub every year so that they can once again colonize the Dyle basin. This small fish that barely reaches 5 centimetres in length swims around throughout Flanders. It feels at home in fresh, brackish, salt, even in polluted water. 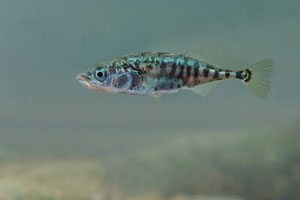 Although the name suggests otherwise, the three-spined stickleback is unrelated to the bass but rather to the seahorse and the pipefish. Striking are the three spines on its back. The fish itself is silver-coloured with black spots on its flanks. During the mating season, the male gets a bright red belly and throat, and at that time its eyes become bluish green. On its menu is a diet of small water creatures, such as mosquito larvae, water fleas, nymphs of mayflies and fry (very young fish). Outside the breeding season, the fish lives in large schools, but during the breeding season, between April and June, the male becomes territorial. He makes a nest on the sea bed out of small plant parts and tries to persuade the females to lay their eggs in the nest. If he succeeds in that, he fertilises the eggs, cares for them (by occasionally supplying oxygen-rich water with his pectoral fins) and guards them against predators.